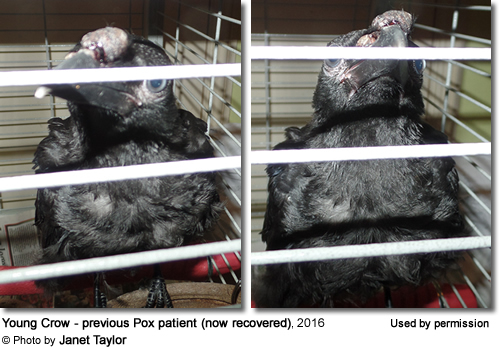 Avian pox can be caused by several strains of the Pox virus and has been reported in at least 60 species of birds, including blackbirds, turkeys, hawks, eagles, owls, albatrosses, and sparrows. There is no evidence that the avian pox virus can infect humans; however, this highly contagious virus can result high numbers of casualties in wild populations. 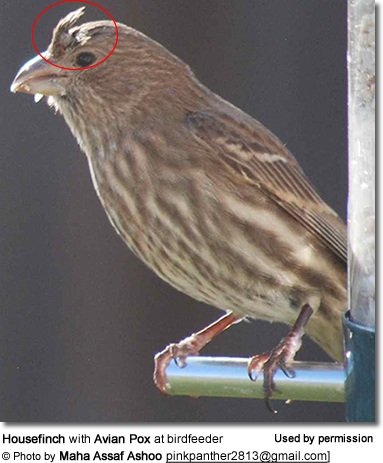 In the more common cutaneous (dry) form, wart-like growths appear on the featherless areas of the body such as around the eye, the base of the beak, and on the legs and feet. In the second diphtheritic (wet) form, plaques develop on the mucous membrane of the mouth, throat, trachea, and lungs, resulting in impaired breathing and difficulty in feeding. Secondary infections often develop, which ultimately lead to an infected bird's death. Mosquitoes: Transmission occurs when mosquitoes feed on birds that with lesion present. Mosquitoes can harbor and transmit the virus for a month or longer after feeding on infected birds. Other insects, such as stable flies have also shown the capability of transmitting the pox virus. 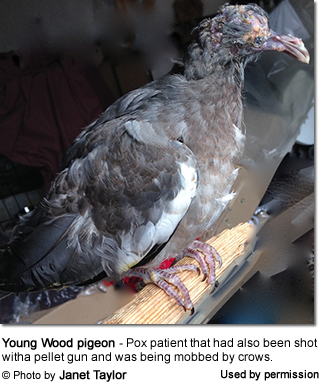 Infected Birds: The Avian Pox virus can be spread by direct contact with infected birds. Contaminated surfaces or water / food: One of the primary sources of infections are contaminated bird feeding stations; or contaminated food / water. Bird baths / feeding stations need to be regularly disinfected with a 5% chlorine bleach solution. Mosquitoes are most likely the cause of transmission within local areas, while wild birds are responsible for outbreaks over greater distances. Avian pox is characterized by wart-like growths on the featherless areas of the body such as around the eye, the base of the beak, and on the legs and feet. Avian pox can be mistaken for conjunctivitis when the eyes are affected. 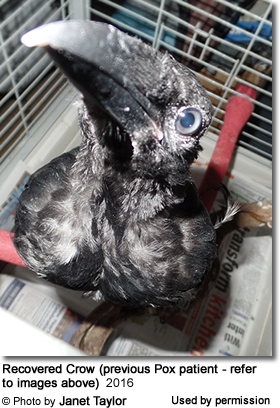 "Growths" on the eye are typically from avian pox. feeders, waterers and birdbaths need to be decontaminated with a 10% bleach solution. INSTEAD, she points out that this self-limiting virus should resolve itself, given time and proper supportive care). However, she typically expedites the process by implementing the following treatment protocol: "I always use cold sore cream to hold the virus. First I clean the skin lesion with Betadine to TCP liquid; then apply cold sore cream to hold the virus in situ - especially if it's near the nostril. I always apply cream to the nostrils to block the virus from passing through to the Vomer (hollow area in the upper beak) - that would be where the virus would gain entry into the beak & become diphtheric. So preventing entry is crucial. Drying out the lesion from the edges in that area will prevent the virus dripping into the throat." Paula Slota (Retired/Volunteer - USGS Natioanl Wildlif Health Center) recommends to report sightings of birds that might be infected with Avian Pox to your respective state conservation agencies so that they are aware of the outbreaks occurring in your state. At the same time, please copy the new USGS National Wildlife Health Center Epidemiology Team at NWHC-epi@usgs.gov so that they continue to receive these reports. 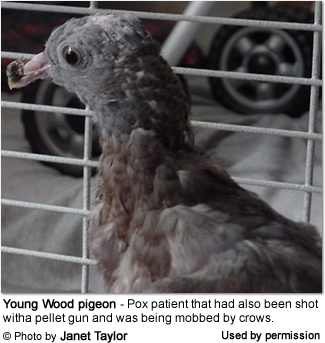 Also included is a link to the chapter in our Diseases of Wildlife (birds) Manual that discusses avian pox.